We all go to the movies to get swept away into a world of thrills and excitement. Unfortunately, many people don’t realize that some of their favorite cinematic moments might be a little too good to be true. What do these five awe-inspiring movie scenes have in common? They were all 100% faked. 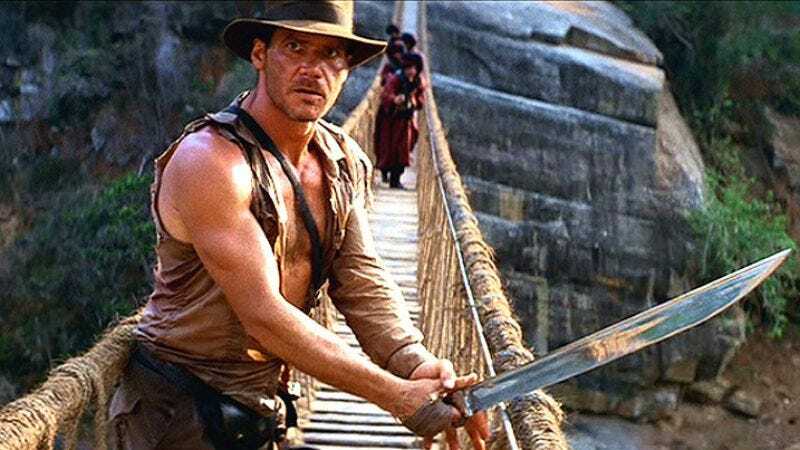 In the unforgettable opening of Raiders, Indy’s attempt to steal a golden idol left him running for his life from a crumbling temple—and one heck of a big boulder. Heart-pounding? Sure. But did it really happen? Turns out the boulder wasn’t the work of the gods, but was actually a prop made out of fiberglass and wood by film director Steven Spielberg and the special effects studio Industrial Light and Magic. Kind of takes some of the danger out of it, doesn’t it? Everyone remembers the rain-soaked, upside-down kiss from the original Spider-Man movie—who wouldn’t want a romantic moment like that? Unfortunately, this particular dream date was more dream than date. Before he was a movie star, Spider-Man was a fictional comic book character created by Steve Ditko and Stan Lee in 1962, with spider-like powers that no real human could ever hope to attain—and that includes hanging upside-down from a web for kissing purposes. Sorry, ladies. Before “taking care” of some problematic business associates, Jheri-curled hit man Jules Winnfield quotes from the Bible passage Ezekiel 25:17 before striking down with his own great vengeance and furious anger. One of the coolest guys, in one of the coolest movies, giving one of the coolest speeches of all time. Just let us have this one, please? Hey, who’s that in the background of Jurassic Park? Looks like Samuel L. Jackson to us. So if you always thought Jules Winnfield looked a little familiar under those Jheri curls, you’re not going crazy. Oh, and adding insult to injury, he was wearing a wig the whole time! All of our inner children still cling to the edge of our seats during the climactic scene in the first Toy Story movie where Buzz Lightyear takes flight and brings a whole generation of kids “to infinity and beyond!” Well, sorry to have to do this, but hold onto your childhoods. One. Hundred. Percent. Animated. And not just this scene—a little digging revealed that, in fact, EVERY scene in Toy Story was actually crafted by computer animators working at a company called Pixar. Not only do Buzz and Woody not exist, they never existed, except on the movie screen and in our hearts. Bummer. Hoo boy, where to start with this one. The Matrix left an indelible impression on everyone who saw it, especially the jaw-dropping rooftop fight with the sinister Agents where Neo first unlocked his amazing power to dodge bullets. But how much of this legendary fight actually occurred? Well, as it turns out, not much. Neo wasn’t manipulating reality—just the audience. This totally staged bullet dodge wasn’t even filmed outdoors. A special effects technique known as chroma key, or “green screen,” was used, capable of placing our movie heroes anywhere from the bottom of the ocean, to the depths of outer space, to, in this case, the top of a building. And what about the entire scenario involving the human race being enslaved by sentient machines? You guessed it: FAKE. We hate to say it, but a pattern is starting to emerge: The cooler the movie, the closer you have to watch. Your new favorite movie might be just another Hollywood hoax.